Welcome back. It’s not often I complete two dios in a month but as you will see, this new one is a lot smaller than my usual work, and set in a completely new period which, I have to say, was inspired in part by our friend the tank man Mark Morin of whom most of you would know well for his amazing work. My other inspiration came from none other than Just Needs Varnish who has also done some very nice work on his tanks along with some great buildings. So if you are new to my site, do yourself a favour and have a look at their work. When I started as a kid back in the 60’s it was all Airfix planes and tanks. I loved them and kept modelling into my teens. Now we are living in good times with regard to the modelling material we have available to us, a far cry from those days of just plaster of Paris and garden twigs! 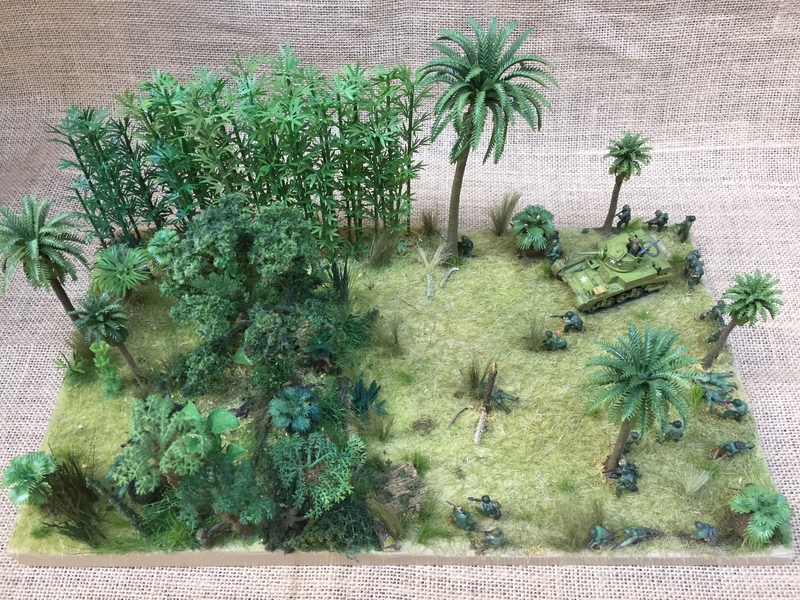 It was when I started work at 17 that I was able to buy a camera, this prompted me to dig out my old models and make living dioramas in wooden boxes filled with soil. Into these I planted grasses and weeds from my parents’ garden to make scenes for my tanks and various other armies, then photograph the scenes just as you are about to see. Having inspired uyou with a bit of nature, I can feel a lot of you running out to your gardens right now! Don’t forget though my favourite weed for a great tree substitute was Petty Spurge, use that and you won’t regret it! Well, nearly fifty years later, I looked again at that 17 year old boy’s work but this time I wanted to go large which created a small dilemma in that I thought I could be running out of space pretty quickly (even though the family allowed me the largest room in the house for my hobby!). Let me say here though that the original plan was that I was going to sell them, but what might be fun and exciting to me is another person’s nightmare. I didn’t stop to think about who would want a bloody great dust collector sitting on their side board, let alone the coffee table, just for a talking point for when the conversation faultered! Just imagine it (Well Syd, I can’t help but notice that diorama that’s blocking your hall, what’s the wife think of your little investment? …) So yes it’s time to be sensible and downsize to smaller jobs (the racks are all full!). However, no promises, I may break out again in the future!! This one is just to show off my favourite tank the M3 Stuart Mk 1, and I have chosen the Pacific War so that I can use my the US Marines. Here I should like to thank Ross in Western Australia, which is on the other side of Australia to myself, for supplying not only mine, but adding some of his spares and paying the postage to me after they were accidentally posted to him with his order! Now I have enough to make fifty small ones! As it was a tiny job, I only needed a few Japanese and was lucky enough to pick up a single sprue of Strelets guys on eBay. As for the plants I was able to purchase most of these cheaply and paint them up to make them a bit more realistic. I have made my palm trees in the past but AUD10.00 for 15 trees was a bargain, and so was the bamboo which only needed a bit of a spray job to look ok for the job, along with some sawdust and wood shavings provided free, courtesy of my daughter who is building a Tiny House, the job was done. That looks great Pat, I do like Dioramas as they tell a story. It reminds me of being a child looking at pictures on the front cover of a book and wondering what is going to happen next. That’s a good way of putting it ,very true, thanks mate . Pat, that is brilliant! The “jungle” looks far too real! Very nice M3 and I’m going to guess it’s the Hasegawa kit? As far as US Marines are concerned, I’ve spotted Airfix marines and Matchbox US infantry and I think some Revell marines. I like the guys dealing with the sniper pit close up, a nice detail! And it surely qualifies for the Armoured April community painting challenge as well! Spot on John mate ,right on all fronts ,I had to get the Revell guys as the Airfix boys come in two different sizes, too much so that they would be obvious ,so it was the larger ones that are the same size as the Revell ones were the go this time round . It was good to do the jungle stuff for a change and thanks for the tick of approval, as at the start I didn’t think I was going to pull it off ! Great work Pat, as always. Very authentic and the trees you bought certainly fit the bill and have come out well. Figures are great too and your eye for composition is once again spot on. Sorry to here you are running out of space but looking at your back catalogue you have had a good innings. Space has become a problem for me too but for all that I suspect we will both ignore that at some point! Besides the kids have to move out at some point don’t they? Wow, Pat, that is a hell of a diorama. The M3 is done very nicely, what is the scale? I like so much here. The USMC helmets are done very well, and the foliage is so realistic. Like any great diorama, just looking and looking tells you so many stories especially with all those Japanese hidden in the jungle. Perfect balance of jungle, figs, and a great tank. Thanks for the shout out, though I guess I am getting a reputation as a “tank guy” because I’ve painted up over a hundred since last October. (Before that not a one, so that’s funny). If your followers are interested my site is markamorin.com and my stuff is there. Still, I just finished HAVOC yesterday (3 days of gaming including running two games) and it’s back to work today – I hopefully will post a roundup and get back to painting, well more tanks for now! Big kudos Pat. Superb and inspired. Thanks mark, the scale I work with is 1/72 and the figures can range from 20mm to 25mm ,i’m glad you gave the thumbs up in regards to the helmets as i like painting camouflager on them .Your comment on the fig / fol balance is interesting as it is always hard to know when to stop ,I have in the past finished fig. placement only to go out in the mourning and say oh no ! and had to remove a few fig. thinking I must have gotten a little carried away last night ! Wow I would not believe that you have only been doing the tanks for so short a time ,that is funny ,but i feel “Tank guy “will stick my friend ! .I just received my second tank for the next small dio along a similar vein so that will bring me up to the grand total of two Iv’e painted so I don’t think I will be a threat to your score EH! . I keep getting new scenarios thrust upon me. Next up is a D-Day breakout so I have some US and Germans to do. Eventually I’ll get back to retroscifi! Having a change is a good idea I from your norm is a good idea ! Looking forward to your next project ,sound good mate. I hope it reminded you of the tropical surrounds you have just left !! .